← What Happens When People Don’t Pay Their Developers? 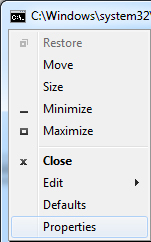 A little known fact, often over-looked, is that the Windows Prompt dialog box is easily expandable to fit the size of your screen. If you click the upper left corner of the prompt screen, you’ll see there is a properties option. 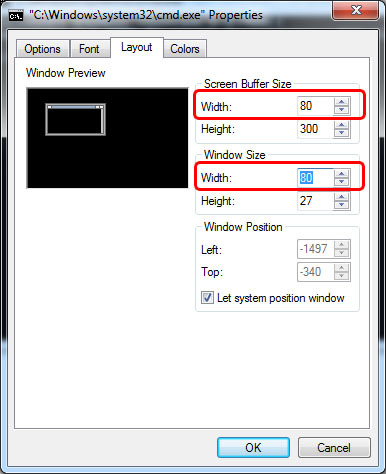 Using this, you can set the width to whatever you need it to be and the great thing about an all Courier New font-base, is that each character is exactly the same width, which means that at 8 pixels per character, you can easily determine what size prompt window you need for what size screen you have. I built a basic table here. Or, you can always just go elsewhere and get a REAL console like Console2, add a background, and stop playing with this Prompt stuff. But, on servers and things, it’s often not a smart idea to install unnecessary things there, or people start to ask questions. So, here’s your guide and here’s a size table. This entry was posted in **, DIY, Hacking, Microsoft, Windows. Bookmark the permalink.